Thank you little wild yeasts for raising my bread! When the weather looked like it might be warm enough for a few days I set about cultivating a new batch of wild yeast sourdough starter. This was four weeks ago. In Hawaii, it took me about 5 days to have a very active starter which we enjoyed using for bread and pizza dough for five years. My friend Nikki now has the starter and is taking good care of it while she bakes for her family. I am thankful that “Henri” has such a great home and is continuing “his” legacy! But back to my starter challenges. It just wasn’t growing. I would peer in every morning, looking for bubbling activity. There was definitely gas emerging, but after the initial release of gases from bacteria, the yeast just didn’t seem to develop. I considered the effects of chlorine on my little buddies and distilled water every day to add to my mix. (You feed the starter every 24 hours with flour and water.) I also considered the type of flour, the hydration level, the temperature of the kitchen, etc. I did everything I could to find a warm spot, even bathing the yeasts in a warm bath when I was home (sinking a glass into another bigger glass with hot water). I ran out of my Hawaii flour and bought new flour. I also finally added some wild blueberries we had harvested at a neighbor’s farm. This particular neighbor is special – Gordon Wilson’s farm has been in his family for generations. Unfortunately he and his wife will need to move and retire in Eastern Washington because it’s too expensive here for them on his pension. So he is selling off his farm, the home he was born in, everything. I was so sad. But I learned later that a young family bought the blueberry farm portion of the land and intend to keep farming it. So…it seemed appropriate as a last resort to add Gordon’s blueberries in hopes that the flora on their surface would kick-start the yeasts in my glass. (I was holding out for just the variety in MY kitchen, but alas, I am happy to add Gordon’s blueberry flora because they have a neat story.) SO – in a day or two I was able to show the boys lots of little gas bubbles distributed throughout the starter! Over the next several days, the bubbles became bigger and more prevalent. Friday morning I was brave enough to try an actual bread, to see if my little “yeasties” were up to the challenge of rising dough. I mixed a wet dough, folded it, checked the gluten window, shaped it and retarded it overnight. Today my schedule did not allow a rigid adherence to proper warming, shaping, etc. so I just went with it and adapted. The oven spring was nevertheless quite impressive! I am ecstatic!!! So happy to have a starter on hand that seems to have adapted to my little ecosystem here, temperature, feeding schedule, hydration, etc. It’s like getting to know your newborn…sort-of. 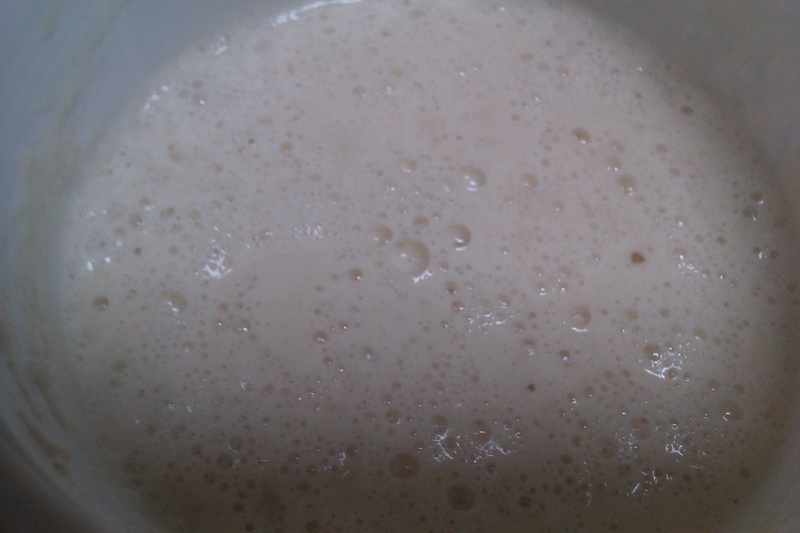 Healthy wild yeast starter. Lots of air bubbles, slightly sweet yeasty smell. Blows the lid off the yogurt container when left on the counter for a few hours. Really freaks you out if you don't know what's happening and the lid hits the ceiling! I know it’s not the same, but exciting nonetheless to nurture a living organism to a point where it can really work for you. The product of my efforts is in the picture. You an click on it to see the crust and crumb structure. Not bad for first effort at a baguette! The bread of a wild yeast starter sourdough is inherently denser (I did not know this until this round of research and experimentation) so I am not going for a light, commercial yeast style bread. Mine is going to be denser. Nice to know that is a distinguishing feature. 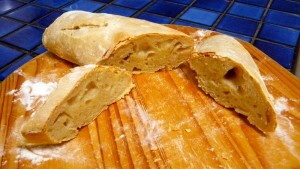 Looking forward to getting back into making a variety of breads as time allows. I wonder if my friend’s hogs will eat this? 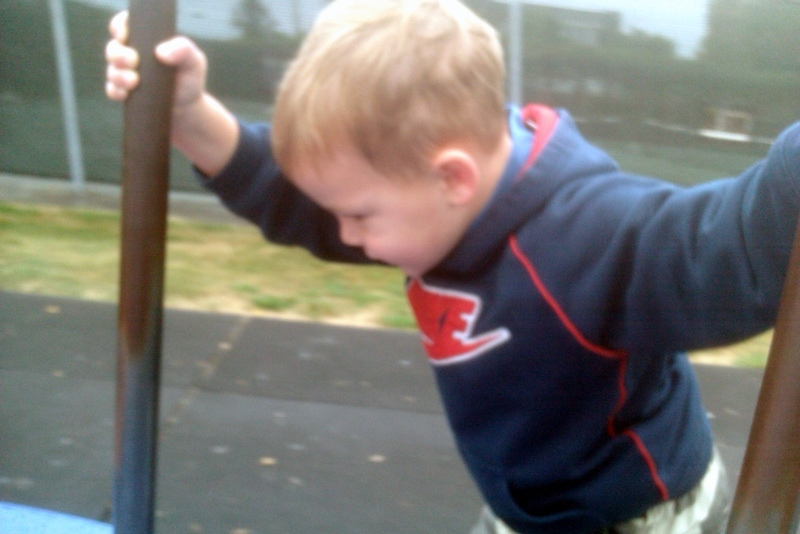 Ben is pushing me pretty fast on a merry-go-round and then JUMPED ON by himself! Wow! I was so excited to make a soup today using leeks (have never cooked with them before, honestly didn’t even really know what they looked like) so it seemed a perfect time to do Safeway home delivery. You can search for the ingredients using a search bar (no wandering the aisles) and just plunk it right into the virtual cart. Sam was under the weather yesterday anyway and didn’t want to go to the market. So I did my order online and scheduled delivery, so psyched to have dinner in the bag, so to speak. Well, the order came but a couple ingredients did not. So…I had my gorgeous leeks but no cannellini beans. The leeks were too cool to let just sit idly, so I improvised. Sometimes I improvise fabulously, other times it just goes horrendously bad. Seems I don’t improvise well here in WA. In 8 weeks I have had 2 complete misfires with the crock pot. Both involved putting pasta in. I have done well timing rice so that it turns out well with beef, but not pasta. I don’t seem to do well with that. And I am not sure leeks EVER want to be eaten in a pasta. Oh well. The dinner was so bad I walked it out to the trash at the road, ready for pickup tomorrow. It is not welcome on my property. However, I was tempted to see if my farm friend’s hogs would eat it. Probably not. They would know better about leeks and pasta. While the crock pot was going I had chicken in the oven, so thankfully the family did have some edible food. 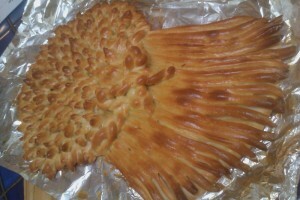 The harvest bread! Sam helped create 115 ears of wheat for the top! For more uplifting news, please click on the picture of Big Ben above to see what we’ve been up to. I loaded more photos a day or two ago. Aloha! We were invited to participate in a tree planting today at Meigs Park. We tagged the trees and named them. I will go back with the GPS and mark the coordinates so we can check on them periodically and see how they're doing. 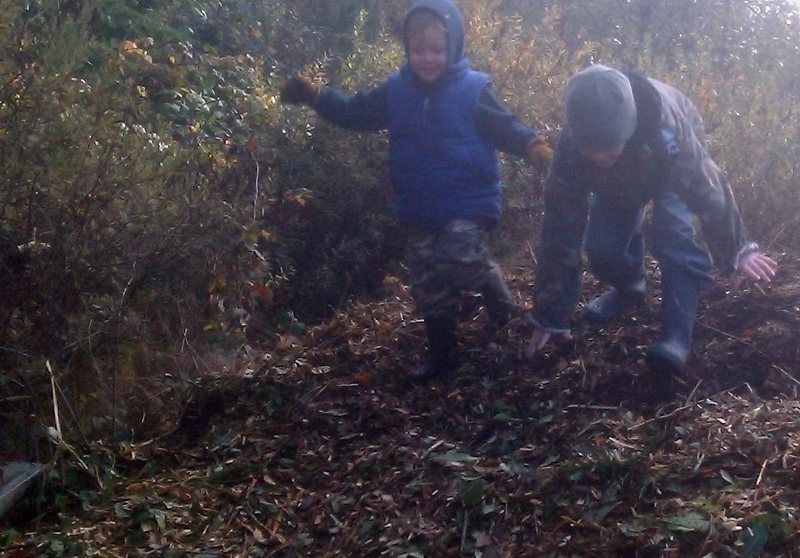 The boys had a great time playing in the mulch pile afterwards! They would run up, take a breath, then run down and face-plant, flossing with the mulch I think! Laughing all the way! A crowd of kids stood around the side, watching and wondering. As were their parents. We are fortunate that so many people here in the NW really seem genuinely interested in the outdoors, conservation, and teaching the children. 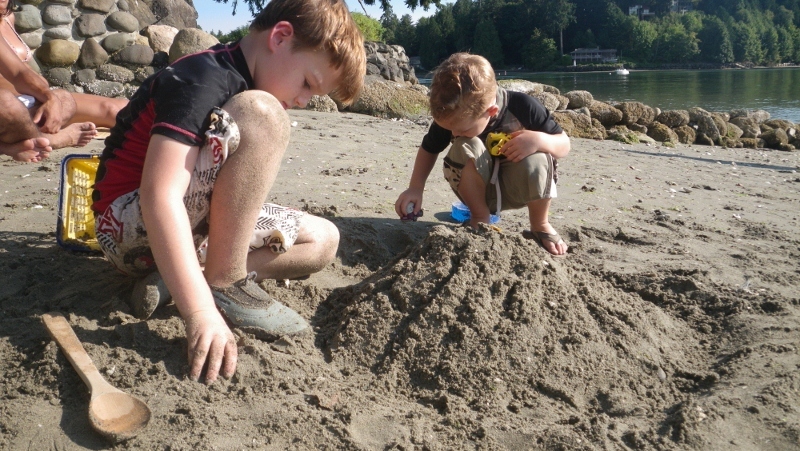 We make events of everything here on the island – planting, harvesting – the kids are involved at every turn. The farmers make an effort to connect with schools and allow the kids to really see what is involved in the cycle of agricultural life. So when an opportunity came up to plant a tree, we jumped at it. We brought the wagon and shovels, gloves, and many layers. It hit freezing for the first time last night! When we headed back to the truck a couple hours later, the boys piled into the wagon with all the stuff, and I ran to shouts of “faster! faster!” Right through the leaves, down the hill, through the mud. Everything was going great until a wheel fell off the wagon and everyone came piling out – shovels, mittens, boys, with granola bar held fast in a little paw (Ben). Somehow Ben never messes up his food when he wipes out. We managed to find the wheel, and COUP of all – the little thing that supposedly holds it in place. We fixed the wagon and piled in again. Well, only Sam. Ben insisted on pulling slowly so it wouldn’t happen again. Then off to the farmer’s market to stock up on our friend Betsey’s potatoes for Thanksgiving. We also bumped into our friend Larry who plays uke, guitar and mandolin in a local band. He let Sam play his guitar at the Farmer’s Market – the national anthem, to a round of clapping after the impromptu performance. Larry has a gorgeous guitar he built. We are conspiring on a kanikapila (Hawaiian ‘kine musical jam session) sometime in December. Then home to split wood, but that was cut short by me breaking the axe. I am such a brute! Then to inside play after chasing chickens and biking jumping. We played Hawaiian music on YouTube and Sam played his guitar. It is cold cold here, but our hearts are warm with thanks for all our blessings. 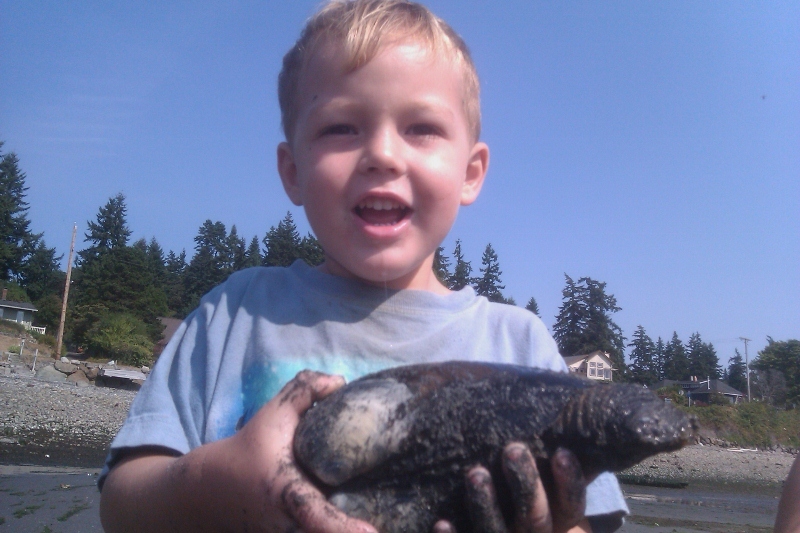 A geoduck!!!! We GOT ONE! Wow! We were just out for a beach walk and adventure seized us, like we grabbed this guy! Click on Ben for the whole story! The most incredible dinner out – ever! Two happy boys with 550g of chocolate earned! I wasn’t going to post for a few days because I know a few friends and family have actually subscribed, which means they get spammed by me whenever I post, so I want to be sensitive to not throw too many posts up or they’ll block me! 🙂 But tonight was just off the charts…so I must capture it while it’s fresh in my mind and heart. So in we go to see Andrea at Marina Market (where we stock up on reward jar treats for the week) and ask for a large hunk of chocolate. She came back with one 200 g bar, and one 250 g bar. So we are well outfitted! On our way (jogging, because Ben just takes off on a run and won’t stop – he jogs a mile without thinking about it) back to the truck I told the boys that they absolutely made my night, my month, likely my year. Sam asked if I would never forget tonight’s dinner, and you know what? I don’t think I will EVER forget it. Andrea at the market said it was really good the boys got to see me being praised, and them being recognized by complete strangers for their behavior. She’s right – it really did make an impression on them, too, that they were so noteworthy that others actually said something to them. I think they got it. We prayed for those sweet people tonight that many blessings would be heaped down upon them because they enriched us so much. Just yesterday we were totally floored and surprised with another generous surprise from the team of real estate agents that represented us and the previous owners. They are all such good people and were there for us as we dealt with some really disgusting surprises upon moving in. We were grateful for them, and we enjoyed seeing them last night now that we are finally all able to laugh about the creepy crawl space! 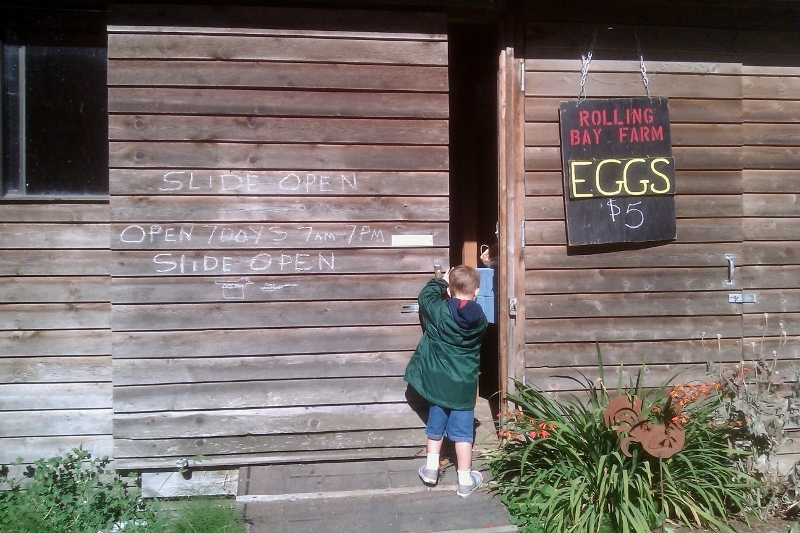 Rolling Bay Farm where we buy our eggs. Bainbridge volcano! Sam thinks this is how Bainbridge came to be, of course. I suspected glacial carving and Googled it later. Yes - 13-15K yrs ago. And by the way, in case you were curious, Bainbridge is about 5% the size of O'ahu. It's 5 miles wide and 10 miles long. And I’ve been thinking about my own acclimating, making new friends, etc. We moved a lot before kids and I made friends easily because I had time to spend with them after work, etc. Then this last stint in Hawaii was quite a long one, and with kids around my time was limited to those with whom I could hike or beach-it. I was blessed to be surrounded by both friends of many years (my “A team”) as well as treasured new friends. I had more friends in my quiver than I could really invest the time I wanted in – that is a good blessing, to always want more time with friends. But it just wasn’t the season in life to indulge that much in me, which is also totally fine. So now we’re here, and I’m missing my dear friends but enjoying seeing who is brought into my path. And last night I was reminded just how lucky I am that I’m not the One fully in charge of that mission. The right people are invariably chosen for me, and it is so gratifying to be warmly welcomed by such truly neat people. We were invited to a bbq with a group of new friends whom I met through Sam’s school. When I meet new people, I tend to try to act very normal, and I have been inadvertently sanitizing my memory a bit of all the things that truly make me, “ME.” I am not sure that makes sense. But when you’re around people who have known you a long time, it is easy to be very comfortable – to be the wide range of things and interests that truly represent you. When you’re meeting new people, you end up hiding most of the facets because there’s just not enough time to give them a full briefing on all your pertinent characteristics. They don’t have any history or context. So they don’t know that I consider a headlamp to be an accessory item, and enjoy parties to which I can carry a flask in my pocket. Or that I treasure the machete given to me by a Samoan chief. Or that I’m into cultivating wild yeast starter and actually name my starter (and further to that point, I am so thankful for a new friend on O’ahu who I met just weeks before moving and who adopted my “Henri” – I just heard from her that he is growing nicely and proudly making sourdough breads, biscuits and even pancakes!) I don’t know where my flask is just yet, and I forgot the headlamp because it isn’t in my usual travel patterns. So they’re not getting the full “Alli” yet, and when they do, will they still like me? Fortunately, I can tell already that these folks are totally welcoming. They are all very unique and interesting people and I look forward to getting to know them. 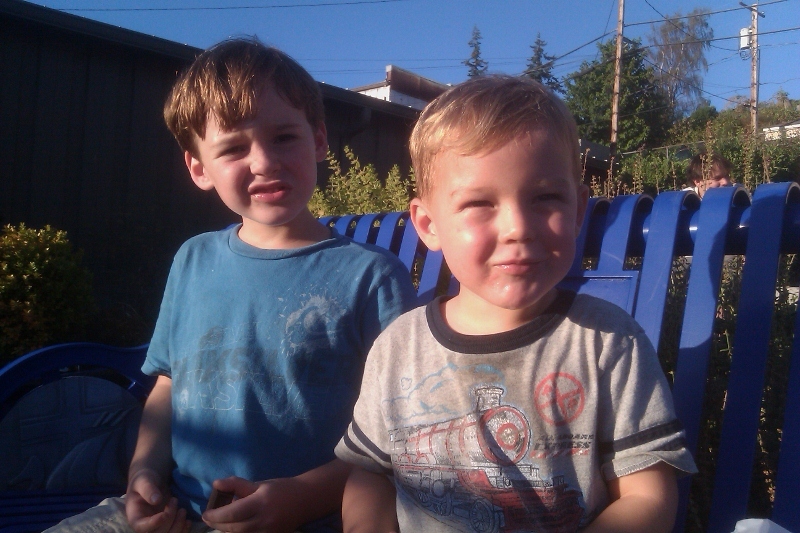 Not sure yet about the mosstache and other initiation rites…but we’ll get there. All that is to say I am richly blessed with new friends, but I sure miss Hawaii and my friends there. I am thinking of you often, and am hoping you drop in on us here on this northerly island. It’s a warm place, regardless of the thermometer! Hogmanay anyone? Grilled SPAM is oh so shockingly good!!! 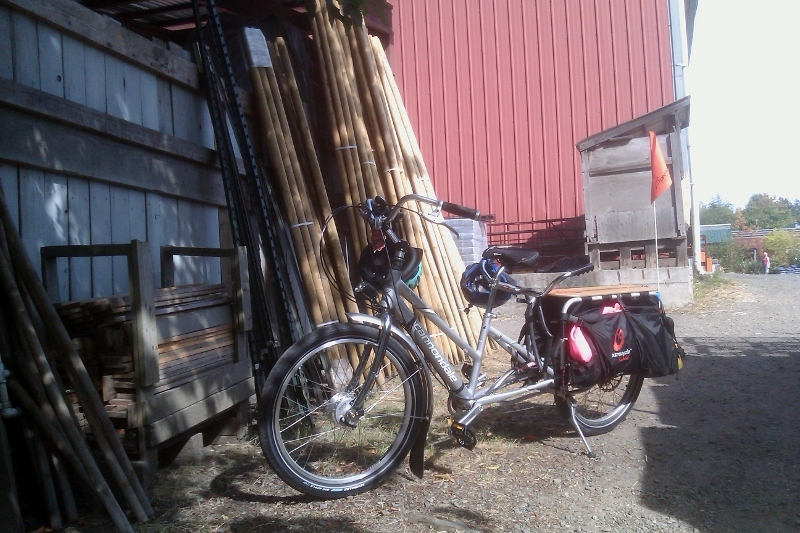 Ben and I rode the sport-utility cargo bike (SUB) down to Safeway and then around by the beach and Bay Hay to home this morning. We had to buy chips for class for snack time. It was a good test errand to run because chips are LIGHT 🙂 That bike is awesome, but the hills are something else. Ben and I had a great time, stopped to pick blackberries, and really enjoyed ourselves out cruising. I had strong memories of biking around Denmark, especially when we passed by the Manitou Beach area with the fog obscuring Seattle on our right, and the little cottages with bright flower boxes picking up the sun on our left.